There are only three things certain in this world: death, taxes, and that solar is unstoppable. The IRS has effectively extended solar subsidies by up to four years. Previously, to qualify for the full 30% Investment Tax Credit (ITC) solar projects had to be COMPLETED before January 1, 2020. Now, they only have to BEGIN construction before January 1, 2020. To get the full tax credit of 30% the project has to be finished before January 1, 2024. Projects begun before January 1, 2021 will get a 26% tax credit, but must also be completed by January 1, 2024. Projects begun before January 1, 2022 will get a 22% tax credit, but must also be completed by January 1, 2024. In addition to the solar subsidies, other energy subsidies have been given extensions. All subsidies are summarized in the table below. The extension of the solar subsidies are coming at a crucial time since the Donald Trump administration has placed tariffs on solar panels. Thankfully, the extension of these subsidies will more than offset the cost of Trump’s tariffs. The tariffs only apply to the solar panels themselves. Conversely, the subsides apply to the entire cost of the solar project. With the cost of imported solar panels expected to fall to $0.25 per watt or below (excluding tariffs) in the relevant timeframe, solar panels, roughly speaking, should only be 1/4 to 1/3 of the cost of the entire solar project. The continuance of these subsidies will leave solar in far better shape. 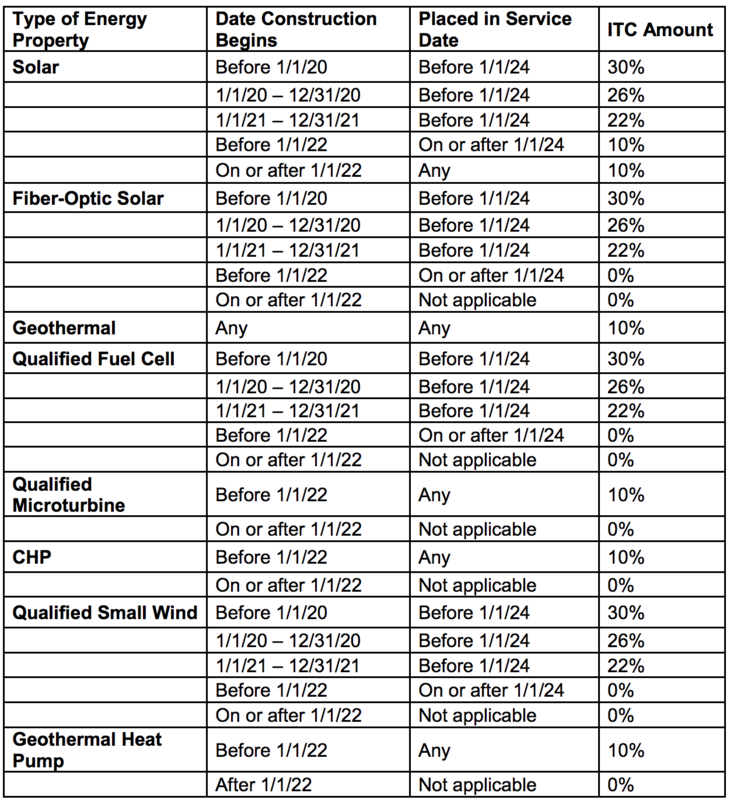 Solar companies have been given wide latitude to meet the “beginning of work” requirement, and it is going to be quite interesting to see what they come up with to maximize the subsidy they can receive.